In the late 18th Century a group of Delaware Native Americans had a village along the Muskingum River. Fearing the encroaching American settlers and the presence of American soldiers, the Delaware's moved out seeking protection under the mighty arm of the British military who were engaged in fighting the American rebels during the American Revolution. After the British lost that conflict, the Delaware permanently left the area for lands in western Ohio, leaving the Coshocton area open for settlement. The first settlers arriving in 1802 called the town Tuscarawa, but that was changed back to the Delaware name Coshocton in 1811. Coshocton is the Delaware name for "black bear town." Coshocton remained a small community until the Ohio & Erie Canal came through. For almost 200 years, Coshocton remained the only city located within Coshocton County. 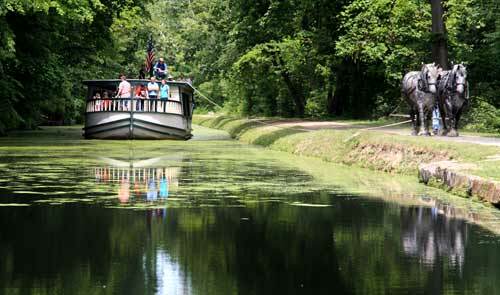 The horse-drawn recreated canal boat ride just north of Roscoe Village is a summer favorite for both kids and adults. The 1.5 mile canal boat ride goes an a restored section of the Ohio & Erie Canal that once served Ohio's industrial and agriculture centers. This free family event has been a favorite for visitors for almost 30 years. 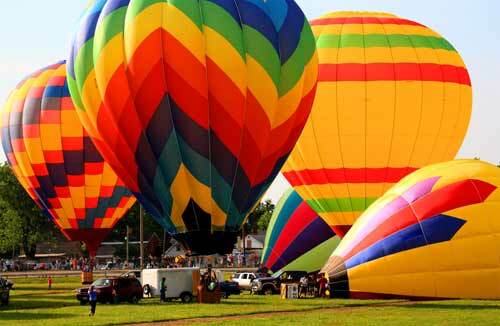 The event features several days of hot air balloons coming and going, a midway with rides for the kids along with the traditional fair food, and special live musical entertainment. Spectators come from all over the state to enjoy watching 20 or more hot air balloons taking off, landing and the popular "night glow". All these events take place in Coshocton, again named in Midwest Living magazine as "One of the 100 top towns to visit"
Looking for something out of the ordinary? Stop by the Unusual Station on SR36 about 7 miles east of Coshocton. As soon as you see the building you'll know this is different. Inside the main building is cramed from floor to ceiling with items for sale similar to an old-time general store. In the back is a small diner and on the wall is the actual "Price is Right" sign used on the set of the famous tv show. The folks at Unusual Station purchased the sign several years back at a charity auction. The sign is authentic and even has Bob Barker's signature. 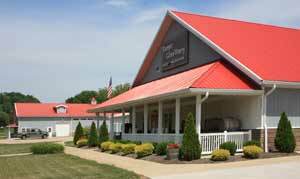 Directly across the highway is the new Raven's Glenn Winery, Tasting Room and Restaurant. Tours of the winery are also available.